A NASA astronaut and two Russian cosmonauts are preparing to leave the International Space Station after living aboard the orbiting outpost for more than five months. The station's Expedition 26 commander Scott Kelly of NASA and Russian flight engineers Oleg Skripochka and Alexander Kaleri will shut the hatches between the station and their Russian Soyuz spacecraft tonight at 8 p.m. EDT (0000 GMT Wed. March 16). The spacecraft will undock at 12:24 a.m. EDT March 16 (0424 GMT March 16). The spaceflyers spent more than five months living and working at the space station and will make their return to Earth on the Russian Soyuz TMA-01M vehicle on Wednesday. The departure of Kelly, Skriopochka and Kaleri marks the beginning of the station's Expedition 27. Kelly, Skripochka and Kaleri are slated to land their Soyuz spacecraft near the town of Arkalyk on the steppes of Kazakhstan at 3:48 a.m. EDT (0748 GMT) on Wednesday. Kelly is the twin brother of Mark Kelly, who will command the space shuttle Endeavour next month on its final mission to the space station. Scott is also the brother-in-law of Arizona congresswoman Gabrielle Giffords, who is married to Mark and is recovering from a gunshot wound to the head suffered during an attack in Tucson on Jan. 8. NASA astronaut Scott Kelly (left) hands over command of the International Space Station to cosmonaut Dmitry Kondratyev (right) during a ceremony on March 14, 2010. Kelly spoke about his time as station commander during a ceremony yesterday (March 14) marking the transfer of command of the International Space Station to cosmonaut Dmitry Kondratyev. "It's a real honor and privilege for me to have been in command of this really miraculous facility for several months now," Kelly said. "We've really accomplished a lot in my time here." The astronauts juggled the arrivals of several visiting spaceships, including unmanned cargo ships from Russia, Japan and Europe, and then capped the mission off with a visit from Discovery – NASA's oldest space shuttle. 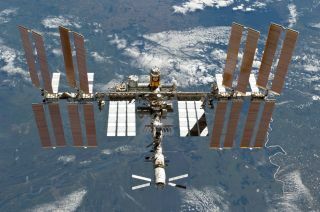 Discovery was flying its final mission and delivered a new robot and storage room to the space station. "Along with that, we've done some very impressive science and we've gotten the space station ready for life after the space shuttle program, which we certainly will miss," Kelly said. NASA is retiring its 30-year space shuttle program this year. Kelly also applauded the strong teamwork involved in maintaining and operating the International Space Station on a daily basis. "We've done all of that not just through our work here on orbit, but more significantly, I think, through teamwork with folks around the world in different control centers, the people who work in the programs for all these modules and the international partnerships involved. If you could see this place in person, it really is, in my opinion, one of the most amazing engineering achievements." The teamwork that is demonstrated on orbit is a testament to how people can work together on Earth as well, Kelly said. "We can meet any challenge and we certainly have challenges back on Earth, and we recognize that." Kelly also spoke about the deadly earthquake and tsunami that devastated regions of Japan on March 11. "Our hearts go out to our partners in Japan that have suffered greatly," Kelly said. "We really feel for them and hope and know they will recover from this, as the Japanese people are very, very resilient." The veteran spaceflyer then transferred control of the space station to Kondtaryev. "What I'd like to do now is turn command of the International Space Station to Colonel Dmitry Kondratyev of the Russian Air Force," Kelly said. "I will do that with just a few simple words, and that is: I relinquish command of the International Space Station." Kelly then repeated the phrase in Russian, and Kondratyev accepted command of Expedition 27. Kondratyev will remain aboard the space station with NASA astronaut Catherine Coleman and European astronaut Paolo Nespoli. They will be joined by three new crewmembers due to launch on an upcoming Soyuz flight from the Baikonur Cosmodrome in Kazakhstan. NASA Flight Engineer Ron Garan, Russian cosmonaut and Soyuz Commander Alexander Samokutyaev and Russian Flight Engineer Andrey Borisenko were scheduled to blast off on a Soyuz TMA-21 spacecraft on March 29, but a technical glitch has forced the Russian Federal Space Agency to delay the flight. A new official launch date has yet to be announced.